Check out my playlist here. One of the standard cliche things I like to do is to play Greek and Turkish songs together. There is a reason for that. Our music shares a lot with Turkish music. We were after all part of the same empire for about 400 years. This week the two acts I mixed together were Θανάσσης Παπακωνσταντίνου (Thanassis Papakonstantinou) and Baba Zula. Thanassis is probably one of the most creative singer/songwriters currently active in the Greek scene. His music takes a lot from traditional Greek music, as well as genres such as jazz, post-rock, and maybe even some noise. Probably one of his best records is Αγρύπνια (Agrypnia), but his other stuff is excellent too. 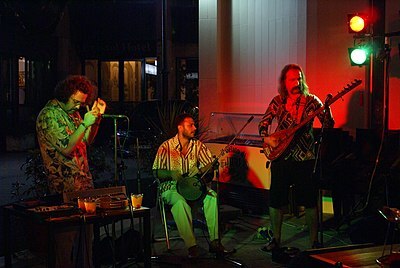 Baba Zula play a brand of music they call “Anatolian Dub”. I had the great pleasure of seeing them perform this year in Istanbul. They are really incredible. Not only is their main guy a massive legend and a great saz player, but they generally tend to have very lively shows, including belly dancers and even live drawing! Their latest album kokler (roots) is a pretty incredible piece of musicianship. Definitely look into them if you like eastern-style music.